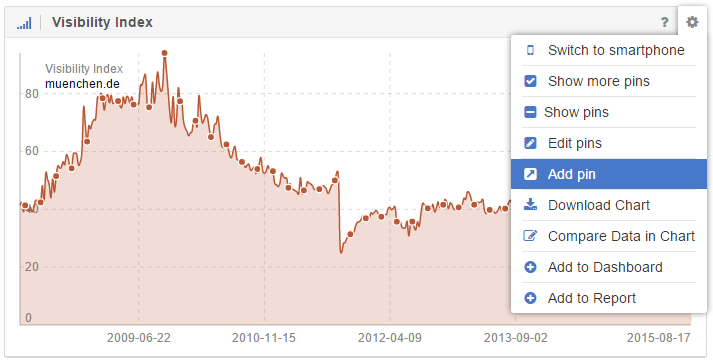 The SISTRIX Toolbox supports website owners by making it easy to document developments. For this, you can use the “Event-Pins” integrated into the Toolbox. These pins come in three different types and are visible in the different charts of the Toolbox. Users who work with pins can find the reason for changes in rankings, visibility or other important aspects much more quickly than those who do not document these events directly inside the Toolbox. These update-pins are official pins put into the software for Google Updates and are available for all Toolbox users; the SISTRIX Gmbh maintains these pins. The time at which such a pin appears in the account is largely dependent on the change of visibility for the domain over the past week. This means that the pin will appear after a certain percentage change is met. 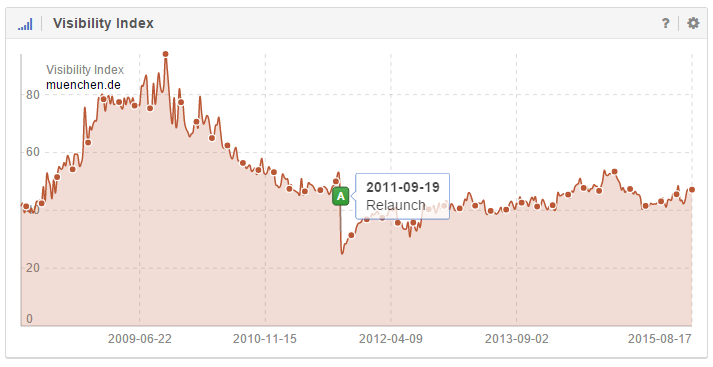 This, however, does not mean that a domain is necessarily affected by a Google Update. It simply means that there is a rather high probability. If you want to be able to trace the visibility history, ranking history etc. back to specific events, like a relaunch or a change in the SEO-strategy, you need to set individual event pins for every domain. 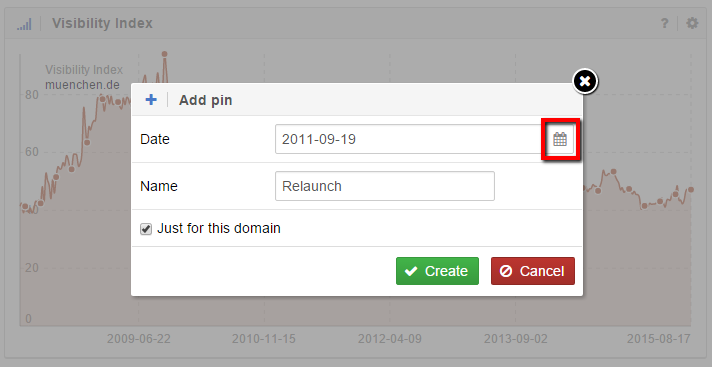 Pins for individual domains may be added either in the pin management or directly in the according graph. First, enter the domain into the main Toolbox search bar. After that, you will see the familiar Visibility Index history. At the upper right border of the chart you will see a gear – click on this to open additional options. After you click on “Add pin”, a box opens in which you can create your own individual event-pin. Choose a suitable name and enter the date. When choosing the date, you can click the calendar icon and then simply select the week in which the event happened. The individual pin for this domain is now saved. This means that no matter where you are in the Toolbox, or what chart you are looking at, the green pin is added, when you are looking at the specific domain. Of course, the pins are only visible on your account and no other account will be able to see them. In professional practice, there are many different reasons for setting up pins. Here are some of the most common reasons. In addition to the public pins and individual pins per domain, there are also pins you can set for the entire account. These pins are then visible on the entire account on every domain. If you want to enter such a pin in the Toolbox, simply hover over your profile picture in the upper right corner to open the settings menu. Then, simply click on “Pins” – or use the direct link https://uk.sistrix.com/account/pins to get to the Pin Management. There, you will find the familiar overview of all existing pins for your Account. Directly above that list, you will find the following input box. If you configured this kind of pin and change the domain you are evaluation in the Toolbox, this pin will still show up for the new domain. These pins, too, are only visible for your account. Alternatively, while creating a pin, you can simply remove the checkmark in the box marked “Only for this domain” to create a global pin. By using an event pin, you can quickly follow and comprehend developments on a domain. Of course, the pins do not replace a project management, but they allow for quick analysis and conclusions. It takes just a couple of seconds to set a new pin. This is something that every Toolbox user should look into. There is no worse situation than when you cannot remember at what time changes took place, and what results those developments had in terms of visibility, rankings and other performance indicators. 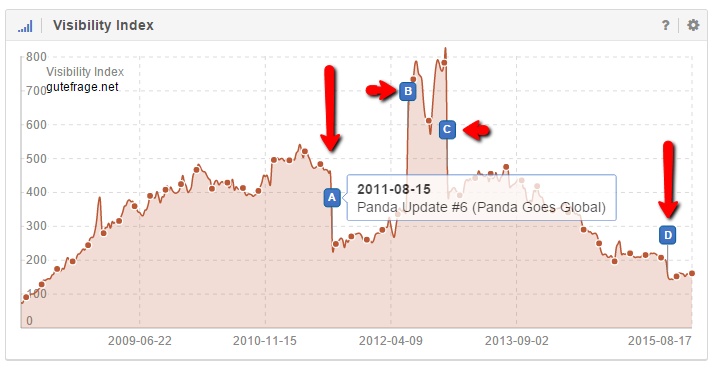 With the gear function in the charts, you may always hide or show all pins. You may edit or delete your own pins in the settings. You cannot, however, influence the global update-pins we add.